We plan to map the full DNA profiles of at least 15,000 people with ALS and 7,500 control subjects, and to perform comparative analyses on the resulting data. Such large-scale genetic research into the origins of ALS is unprecedented! As such, we are fully committed to making a revolutionary breakthrough in the search for the cause of ALS. But, to reach our goals, we need your help. More than 200,000 people worldwide are living with Amyotrophic Lateral Sclerosis (ALS), otherwise known as Motor Neuron Disease (MND) or Lou Gehrig’s disease. Relatively little is known about the cause of this progressively degenerative neurological disease. There is still no treatment. The average life expectancy of ALS patients is three years. It is almost certain that the disease has a genetic basis. Project MinE is a large-scale research initiative devoted to discovering the genetic cause of ALS. The ultimate goal is to identify genes that are associated with ALS. The function of these genes may lead to disease pathways for which treatment can be developed. In order to reach this ambitious objective, we plan to map the full DNA profiles of at least 15,000 people with ALS and compare them to DNA profiles of 7,500 control subjects to uncover associations between specific variations in genes and ALS. This type of comparative research requires enormous numbers of DNA profiles and is very costly. That is why we need your help. Make a donation or start a campaign today! Project MinE, make it yours! The ALS Foundation Netherlands is the Dutch ALS association. It was one of the founders of Project MinE. It’s mission is to contribute to discovering the cause and eventually a cure for ALS in the future, while helping to make the lives of ALS patients more bearable now. It executes on this mission by organizing and coordinating fundraising campaigns, and facilitating the flow of funds in order to expand ALS treatment and research, most notably by the Netherlands ALS Center. The foundation is a registered charity in The Netherlands, as such it bears the hallmark of the Dutch Central Fundraising Bureau (CBF) and is registered with the Dutch Tax Authority as an organization that serves the public good (ANBI). The Netherlands ALS Center is located in the University Medical Center (UMC) Utrecht and was one of the founders of Project MinE. The goals of the ALS Center are to optimize and accelerate the diagnosis of ALS, to improve the quality of care and treatment that ALS patients receive, and to initiate, encourage, and facilitate research into the cause and a possible cure for ALS. The center is headed by Professor Leonard van den Berg and works closely with several ALS centers throughout Europe and the rest of the world. The Netherlands ALS Centre is part of ENCALS, the European Network to cure ALS, which is chaired by Prof. Van den Berg. 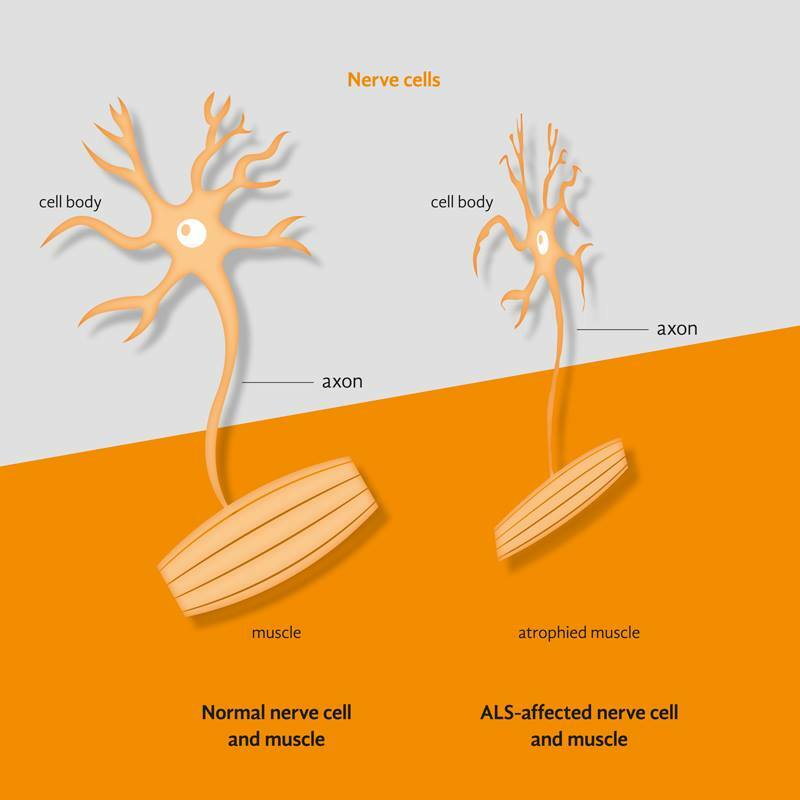 Amyotrophic Lateral Sclerosis (ALS), also known as Lou Gehrig’s disease, Charcot disease, or motor neuron disease (MND), is a very serious and debilitating neurodegenerative disease. In patients with ALS, the motor nerve cells (motor neurons) in the spinal cord, brainstem, and brain progressively deteriorate and die. Motor neurons stimulate the muscles in the body to action. Because fewer signals are send to the muscles by the dying nerve cells, the disease leads to progressive muscle weakness. Most often, the first symptoms of ALS are reduced strength in the arms and/or legs, or difficulty speaking, swallowing, or breathing. As the nerve cells send fewer and fewer signals, the muscles begin to atrophy, meaning that they get smaller and thinner. After the nerve cells completely die, the patient is effectively paralyzed. As such, respiratory failure is the most common cause of death for people with ALS. ALS can strike at any adult age, but most often onset of the disease occurs between the ages of 40 and 60. In all cases, ALS is fatal. The speed at which ALS progresses varies per person, but the average life expectancy is three years after disease onset. Only a small portion of the cases of ALS can be attributed to a familial form of the disease. This hereditary form is rare and is usually an already known possibility within the families it affects. In all other cases, the precise cause of ALS is not known, although the cause is almost certainly (partly) genetic. There is no cure and still no effective treatment for ALS. Why is this initiative called Project MinE? The goal of Project MinE is to systematically dig deep into thousands of DNA profiles in order to discover the different genetic mutations that can be connected with ALS. This connotation of “digging” or literally “mining” into the genetic data to find something valuable is the source of the “mine” in Project MinE. What is DNA? What is a chromosome? DNA, or deoxyribonucleic acid, is the structure that carries all of the encoded hereditary characteristics inside of living organisms. 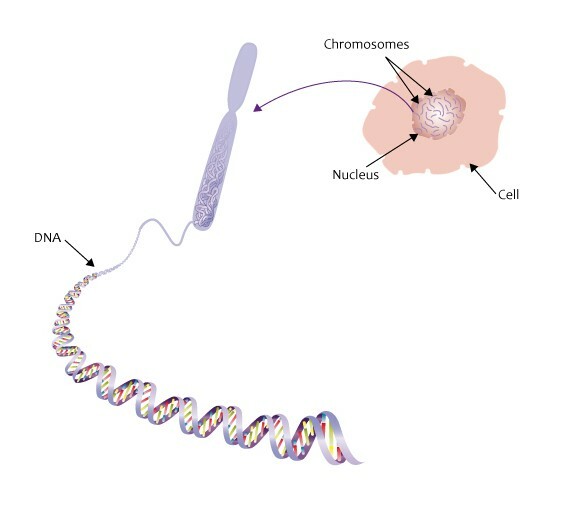 DNA is present in the nucleus of all body cells. A DNA molecule consists of two long intertwining chains (double helix) of molecular building blocks. Each of the building blocks in one of the chains is connected to a corresponding building block in the other chain. There are four types of building blocks: A (adenine), T (thymine), C (cytosine), and G (guanine). For example, the sequence of building blocks in a DNA chain might look something like this: AGGCTTATAAGGCCA. These DNA molecules are surrounded by proteins which ensure that the long DNA chains are folded and twisted in an orderly fashion. The DNA molecules and the surrounding proteins form together what are called chromosomes. In each human cell nucleus, there are 46 chromosomes, organized in 23 pairs. Each pair features one chromosome inherited from the father and one from the mother. An inherited trait resides in a small piece of DNA called a gene. A full set of genetic information from a living organism is referred to as a genome. Although a large portion of the DNA in each human being is exactly the same, there are also unique differences. You can see this reflected in a wide range of physical characteristics, such as eye colour, hair colour, and height. For certain diseases, a predisposition to develop them is determined in the DNA and therefore hereditary. In addition, there are also spontaneous changes, known as mutations, which can occur in the DNA and also cause various diseases. It is precisely these genetic differences and mutations in the DNA of ALS patients that we are examining in order to come to a better understanding of which genes contribute to the onset of the disease. A DNA profile is the full description of the unique DNA characteristics of a given organism. It can be mapped and read with the aid of whole genome sequencing techniques. The full DNA code of an individual can be obtained from a blood sample. 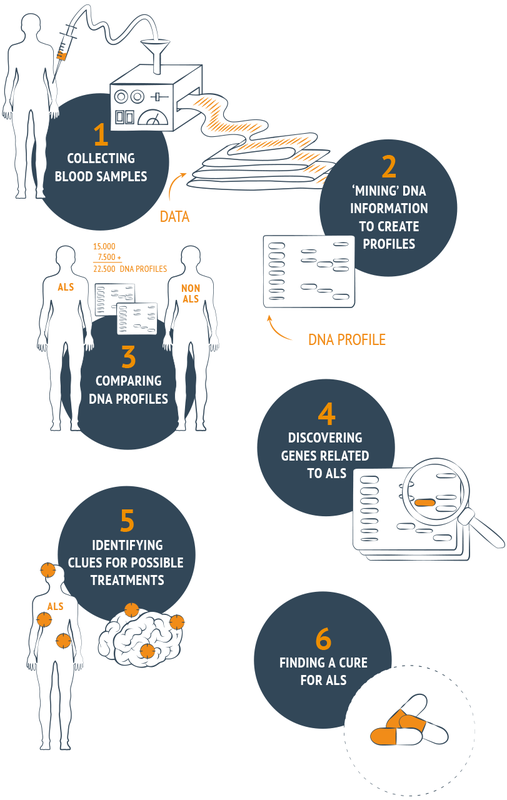 By comparing the full DNA profiles of people with ALS with those of carefully selected control subjects, Project MinE aims to detect the genetic differences and mutations that contribute to ALS. Whole genome sequencing involves reading every single of the 6 billion letters (3 billion base pairs) in the genome. It is the technique used in laboratories to read and map the complete DNA code of a living organism. The result of this process is a full DNA profile of that organism. On their own, these profiles do not provide a lot of valuable clinical information. They must be compared with the profiles of control subjects in order to come to a better understanding of the genetic differences and combinations of mutations that contribute to the onset of ALS. 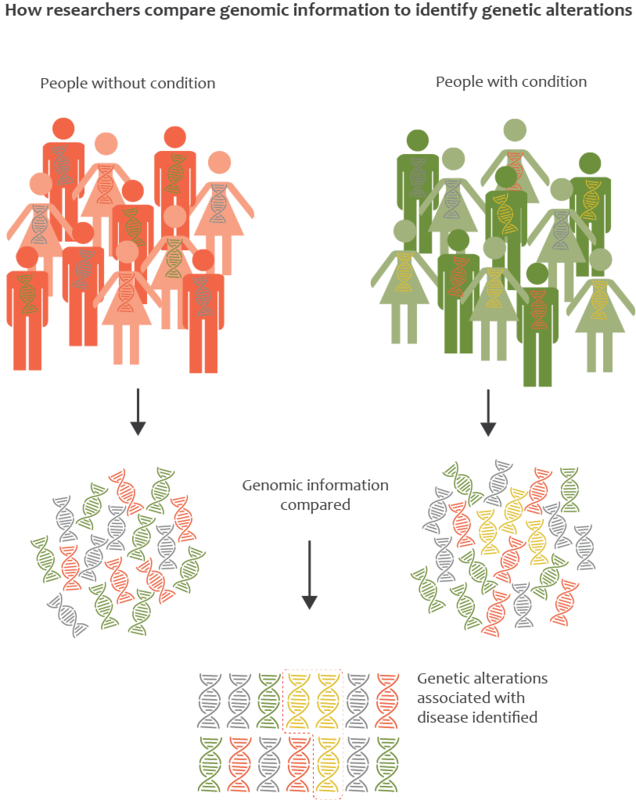 A genome-wide association study (or GWAS) compares small variations in the DNA, called ‘single nucleotide polymorphisms’ or SNPs (pronounced “snips”) between people with ALS and people without ALS. If certain SNPs occur more frequently in people with ALS than in people without ALS, they are considered to mark a region in the DNA that may be associated with a person’s risk of developing ALS. Because GWAS can look at thousands of SNPs at the same time, it is a powerful tool to find the genetic causes of a complex disease like ALS. Why do we need 15,000 DNA profiles from people with ALS? We know that there are multiple (genetic) factors that contribute to people developing ALS and that oftentimes it is a complex combination of these (genetic) factors that leads to someone getting ill. We also know that it is possible for these genetic mutations to show up in healthy individuals and that they never lead to developing ALS. Because of this complexity, it is imperative for us to compare as many DNA profiles from people with ALS with control subjects as possible. This will allow us to come to a better understanding of the genetic differences and combinations of mutations that have a strong causal effect on an individual developing ALS. The more profiles we study, the more trustworthy the results of our research will be. Where will all of the DNA samples for Project MinE come from? The DNA of 15,000 people with ALS needed for Project MinE will not only come from Europe, but also from the United States, Australia and many other countries around the world. Thanks to the cooperative relationship of the leading ALS centers throughout Europe, via the European Network for the Cure for ALS (ENCALS), and beyond, Project MinE has been quickly set up and rolled out further. What is the role of my ALS Centre? In every country participating in Project MinE, one or more ALS centres are connected to our project. They contribute DNA profiles from blood samples of patients and control persons. After being sequenced this anonymous data of the DNA profiles is stored safely and is being used to study the genetic causes of ALS/ MND (Motor Neuron Diseases). How can genetic data give insight in environmental risk factors for ALS? Genes can be switched on or off. This gene expression is influenced by lifestyle and environmental factors. Gene expression can be studied in genetic data. By including methylation data, project MinE hopes to contribute to more knowledge about gene expression in relation to ALS risk. This research field of gene expression is called epigenetics. Read more about epigenetics in Project MinE. Gene therapy is the use of genetic instructions to produce a protein to treat a disorder or deficiency. By gene therapy researchers might be able to mend the default in an ALS gene, or inactivate the faulty gene. Gene therapy might also help if it could deliver a beneficial protein, to salvage dying nerve cells. Gene therapy is only one of the ways in which finding all ALS genes can lead to effective treatments for ALS. By studying the disease process in IPS cell, based on cells from patients, researchers look for therapeutic options to stop the disease process. These therapeutic options might benefit large groups of ALS patients, whether they carry a mutation on an ALS gene or not. What is precision medicine and how does Project MinE help to get there? Project MinE results in big data for the search of the genetic causes of ALS. This data on genetic causes creates the opportunity for precision medicine that target the individual patient’s disease process. If we know whether a patient carries a mutation in an ALS gene, we can study what ALS proteins are over or underrepresented in the motor neuron. By studying this disease process in detail in vitro in motor neurons, we can test effects of new treatments. These new treatments are thus specifically targetted for the individual patient and could be effective for sporadic as well as familiair ALS cases. This could hopefully lead to effective treatments for ALS/MND. I have ALS. Besides making a donation, how can I get involved in Project MinE? For the research undertaken by Project MinE, genetic material obtained from blood samples of both people with ALS and control subjects will be used. We recommend that you contact your doctor or local ALS center on how to participate in local ALS research. If you are living in Europe, find your closest ALS center on the website of ENCALS (European Network to Cure ALS). If your local ALS organization has not yet joined Project MinE, please encourage them to get in touch with us via info@projectmine.com. I do not have ALS. Other than making a donation or starting a campaign, what’s the best way for me to participate in Project MinE? For this study, genetic material from both people with ALS and control subjects will be used. In order to guarantee the quality of the comparative analysis, the control subjects must meet certain criteria. For this reason, it is not possible for control subjects to register themselves for the study. I am an ALS researcher. What clinical data do I need to collect along with a patient's blood sample to become a partner in Project MinE? Along with genetic material, some minimal clinical data needs to be collected for each individual in Project MinE. This core clinical dataset has been defined for Project MinE and guidelines can be found here. This includes the Edinburgh Cognitive and Behavioural ALS Screen (ECAS).